Moving Day Tips | Same Day Move | Cummings Moving Co.
Be ready, 100% packed and ready to go before your DIY team or the professional moving crew arrives. Remember, most moving companies handle local moves on an hourly basis, so you save money when you are all set. Walk through the house and point out anything that might be in the way – ceiling fans, low-hanging fixtures, fragile wall-fixtures, etc. Pack your car BEFORE your movers arrive or have them help you pack it first so that things that do not fit in your car can go on the truck. 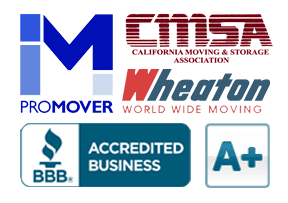 If you are working with a mover, you need to be there when your truck and moving crew arrives. You also need to remain there until everything is loaded on the truck. If you cannot be there, you need to have someone you trust as your proxy. That person will need to direct the movers and answer questions on your behalf. If you cannot be there, make sure your moving company knows the name and phone number of this person so there is time to notify the driver of your truck with the updated information. Make sure to be on hand as the truck is loaded to check the condition of your belongings as they go on the truck. Before the truck pulls away, make a thorough check of each room for forgotten items – inside cabinets and behind doors too. As you button things up at your old space, make certain that wall switches are in the off position, and that all windows and doors are locked. Double check the door lock before you call it done. If you need to drop the keys somewhere, remember to do that before you head off to meet the truck at the new space. Make sure to arrive at your new home ahead of the truck. If the truck will be in transit for a few days, get there a day ahead of time so you can make sure the utilities are set up. If you have time before the truck arrives, make a note of where you want the moving crew to place your furniture. Think it though and have them put it in the spot you think it will stay. Be ready to pay the driver via the payment method agreed to ahead of time. Cash tips are always appreciated. Here are some tips to tipping your moving crew. Have your move-related paperwork and/or Moving Binder handy.